The multi Grammy Award-winners’ tour supports their 2016 LP, WALLS (We Are Like Love Songs). Their seventh studio album reached #1 on the Billboard 200 Albums chart. Visual Director Anthony Cairns built the show, programmed the d3 media servers and operates them on the tour. This marks his first outing with d3 systems. Cairns was first introduced to d3 by Stefaan ‘Smasher’ Desmedt at V Festival in 2016. He then followed this up with custom in-house d3 training from Rodd McLaughlin at the d3 New York office. For the tour Cairns was tasked with producing a three-act show cataloguing the band’s hits from their seven albums. A three-part motorized Austrian drape serves to segment the show, creating a unique look for each act, thematically following the musicians from their club days to the present. Cairns has main and understudy 4x4pros on the tour, each with three VFC cards genlocked to Trisync from the camera system. A dozen HD cameras run through a Grass Valley Karrera switcher; four auxiliary lines from the Karrera feed the d3 media server. 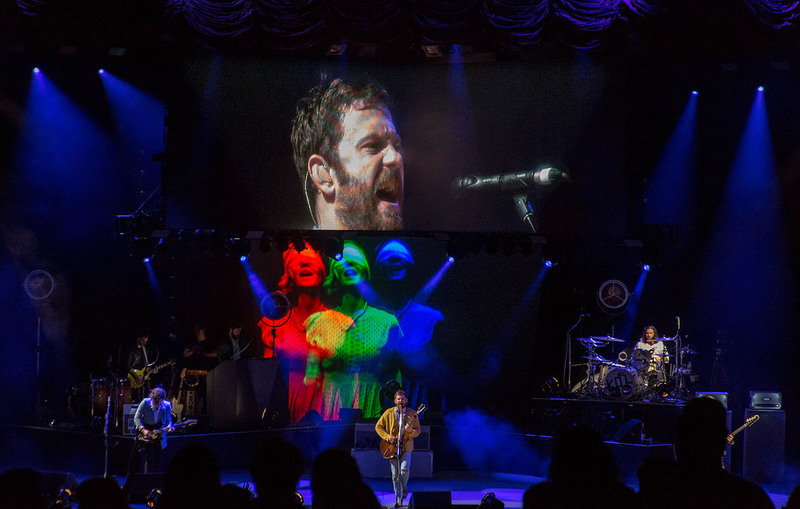 “Combining live cameras with content we use the d3 to drive all the screens,” which include Roe 7mm LEDs for stage left and right IMAG chevrons, a club chevron, an upstage wall masked into a V shape by d3, and a W-shaped riser on the riser facia, says Cairns. While Cairns was preparing for Hyde Park, he worked with d3 to import the extra pieces of the Hyde Park configuration, provided by Video Design, into his show. During a few days off in Dublin he re-delivered much of the content and pre-programmed the show using clips up to 11,000 pixels wide. “Without the physical screens, this would have been much harder on any other server,” he reports. Cairns also likes the ability to add custom screens on site, which is useful for one-off corporate gigs where he has to customize the show to fit the corporate design. “d3 allows me to do this fast and efficiently and has given us more power to control whatever is presented to us, even at the last minute,” he says. Cairns uses 35 video layers and four Notch layers to run the tour. He believes that d3’s Sockpuppet feature “has been crucial for me and my style of programming and operating.” He worked with d3 to customize Sockpuppet and the grandMA2 to create a workflow similar to what he’s been used to in the past. He gives high marks to d3 support, which has been particularly important for someone new to the system who requires the ability to modify the show for different gigs.